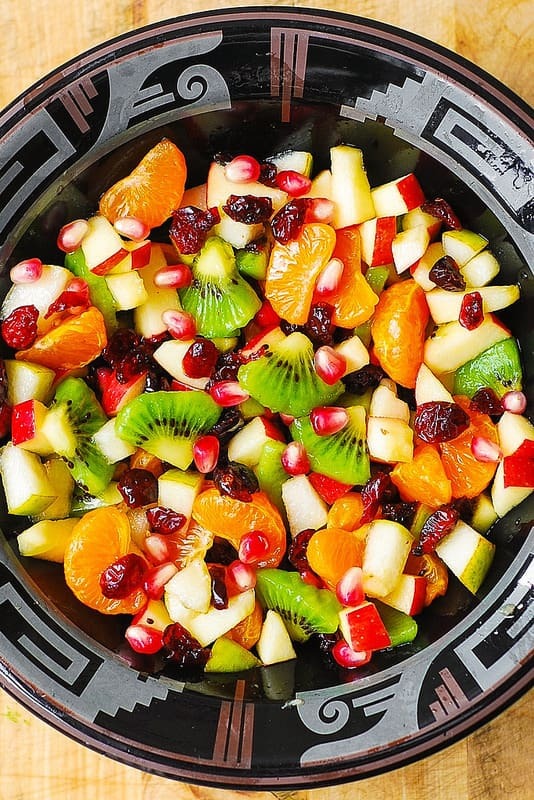 Winter Fruit Salad with Maple-Lime Dressing – healthy, gluten free salad that utilizes seasonal winter fruit. This colorful and vibrant side dish will look great on your Thanksgiving or Christmas table! The ingredient list includes red apples, pears, clementine oranges (or mandarin oranges), kiwi fruit, dried cranberries, and pomegranate seeds. This salad is packed with anti-oxidants, vitamins – all the good stuff you need, especially in the Winter. Combine all salad ingredients (red apples, pears, kiwi fruit, pomegranate seeds, dried cranberries, clementine oranges) in a large bowl. In a separate small bowl, whisk together the dressing ingredients (2 tablespoons of maple syrup and 1 tablespoon of lime juice). 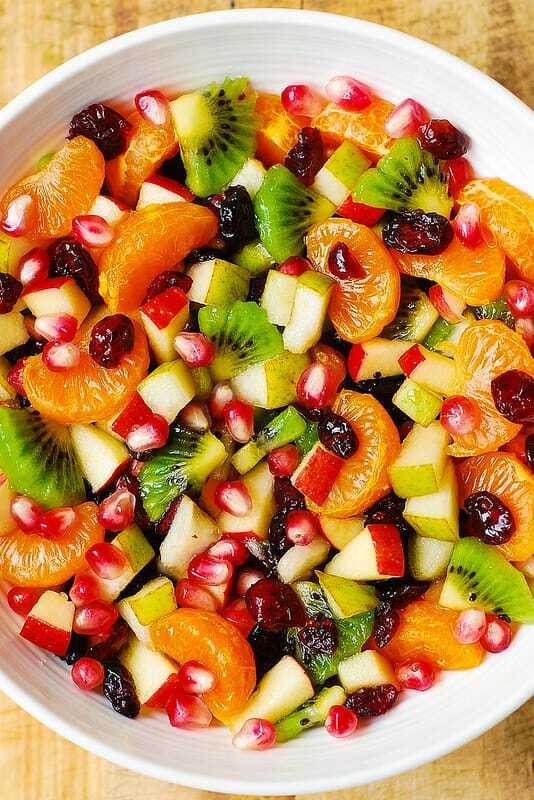 This healthy winter fruit salad will fill you up with the nutrients and the vitamins during the cold winter months. It will also make a great holiday menu item, for Thanksgiving or Christmas or any other holiday. 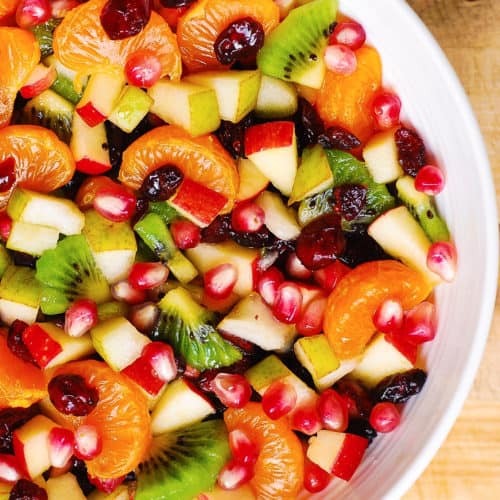 Salad ingredients include red apples, pears, kiwi fruit, pomegranate seeds, dried cranberries, clementine oranges (you can use mandarin oranges, too) – all of that tossed in a delicious maple-lime dressing! Butternut Squash Salad with Roasted Brussels Sprouts, Cranberries, and Pecans – cinnamon butternut squash tossed with nuts and dried fruit. One of the best Thanksgiving side dishes! Autumn Salad with Pumpkin Seeds, Cranberries, and Pecans – this delicious Autumn salad features all our favorite seasonal ingredients! Winter Fruit Salad with Maple-Lime Dressing - healthy, gluten free salad that utilizes seasonal winter fruit. The ingredient list includes red apples, pears, clementine oranges (or mandarin oranges), kiwi fruit, dried cranberries, and pomegranate seeds. This salad is packed with anti-oxidants, vitamins - all the good stuff you really need, especially when it's Winter. Perfect as a holiday dish for Thanksgiving, Christmas, or New Year's Eve. 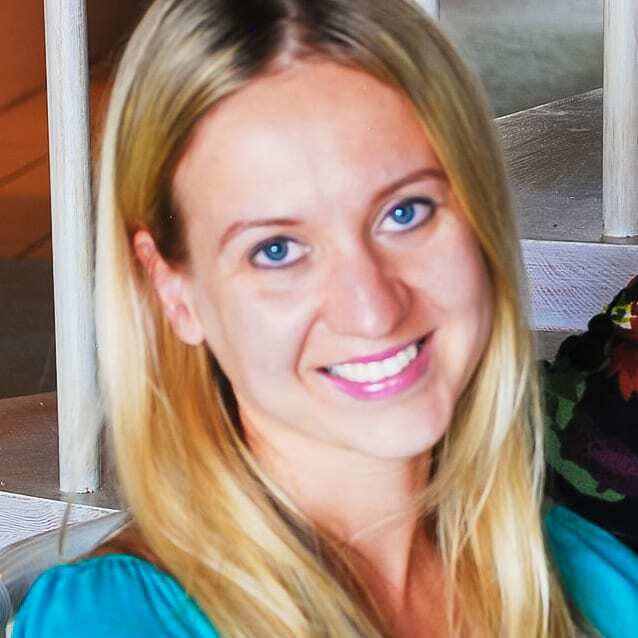 I’ve made this a few times for family gatherings, and have received lots of compliments. When I asked my nephew recently what he wanted for his birthday, all he asked for was this fruit salad. This salad makes 6 servings. I made this last year for our family holiday brunch. They loved it and requested it again this year! I am very happy to hear that you made this recipe more than once! 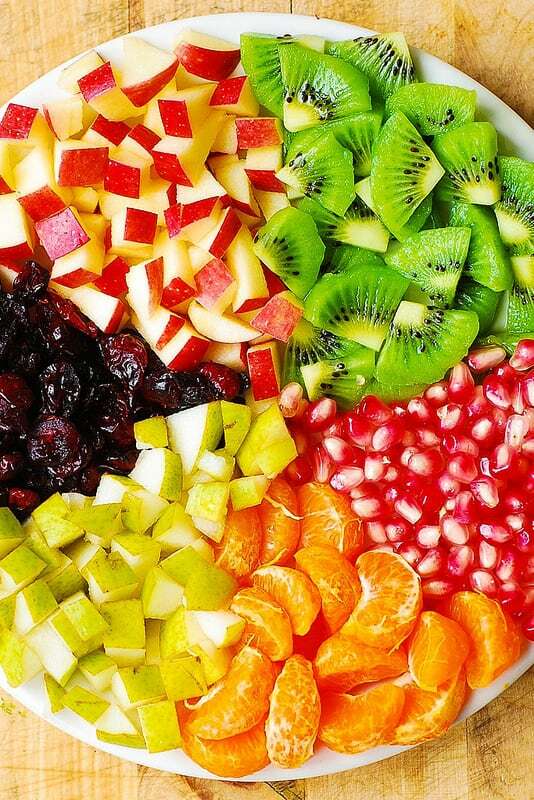 Can I make this fruit salad a few hours before serving it? I am worried about the pears and apples from turning. Any tips appreciated! Brought it to a farm potluck with a maple syrup theme this afternoon, left with an empty bowl. Love it. This may be a silly question but … if you pour on the dressing a few hours ahead will the fruit get too soggy? I would add the dressing right before serving for best results! I recently made this beautiful salad for a baby shower and received many compliments. Pretty presentation and very yummy tasting! I will definitely make it again.